Today's Buyer Is In the Driver's Seat. Image courtesy of John Wiley & Sons, Inc.
Once upon a time, sales reps traversed the continent carrying barely portable computers with the hopes of meeting maybe two out of three potential clients face to face. How many times do you think those reps tried to sleep on a crowded plane and dreamed about clients coming to them? Cut to: today, where the inbound approach to marketing makes that sales dream come true. However, the selling game itself has been flipped on its head. Yesterday, sales reps controlled all the information a prospect needed to make an informed purchasing decision. Today, with only a laptop and a few keystrokes, the buyer is in the driver’s seat. 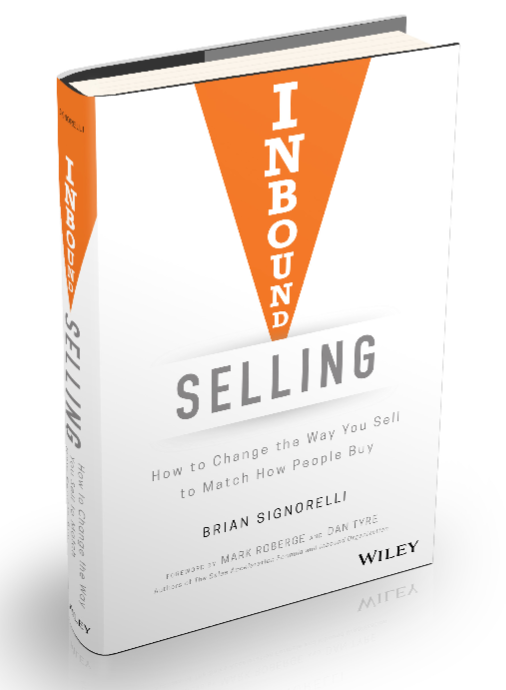 Inbound Selling translates the connectivity and insight produced by inbound marketing into a world-class selling strategy in tune with today’s informed and empowered buyer. Inbound Selling is a handbook for organizations, managers, and sales professionals who are ready to adapt to a world where the buyer is in control and competition is closing in. As a first-time salesperson and sales manager, a top performer and studious learner, Signorelli provides a first-person account of his years inside the HubSpot rocket ship as it grew revenue from tens to hundreds of millions per year. Combined with interviews with accomplished sales executives and lessons learned from books and training, Signorelli builds on decades of sales expertise that will be useful for sales professionals of all levels of experience and organizational responsibility. Having read hundreds of sales books, I have not read one that so thoroughly provides so many practical lessons. Inbound Selling dismisses the notion that “sales” is a dirty word and shifts the way you think about how you sell. In departing from the well-known, pushy and abrasive sales tactics of yesteryear, Brian advocates a highly personalized, yet scalable approach of identifying and remedying a buyer’s current business challenges. He laces the pages with humorous anecdotes of humbling experiences to present an inviting learning environment for anyone in sales or anyone interested in sales. It’s an evocative read that provides a turnkey framework that’s as comprehensive as it is pragmatic. To put it plainly, if you’re not “Inbound Selling,” you’re doing it wrong. You hold in your hands a complete playbook for the journey of a sales rep from old school to what works today. Buyers have changed. Many salespeople haven’t. Nearly every buying decision starts online. Buyers have as much or more information than salespeople. Salespeople need to work on improving the all-too-tenuous relationships that exist (or more likely don’t exist) between buyers and sellers today. Sales reps processes have been shaken up due to the disruption of technology. Brian’s been there and done that. He states, “I was never supposed to be in sales.” Yet he learned and grew as a young rep at HubSpot into a sales leader. He’s been down and dirty in the front lines of sales. He’s emerged with this book and both strategic and tactical advice for how to navigate the sales journey with today’s empowered buyers. Beginning with his journey as an inexperienced rep with lots of ideas, but no real sales experience, Brian walks us step by step through his sales journey: his emotions on hearing “No” over and over (and what it felt like to hear “Yes”), his real-world experiences and how he could have done better, why he decided to move into sales management—and what he wished he had known before making that move. Unlike high-level strategic sales leadership books, which are great in theory but with little practical reality, this one is deep in the trenches, sharing hard-won insights from personal experience and digging into the mechanics of how to sell now. Today, not 10 years ago. Buckle up for this inbound sales journey—it’s packed with actionable examples throughout. For any salesperson, sales manager, or business owner looking to learn how to adapt to the new way customers buy and turbocharge their growth, this is the book! The world of sales has been flipped on its axis over the past decade. Buyers have seized control from what once was a highly orchestrated, controlled, and (some would say) manipulative process. Salespeople and sales organizations have had to learn new skills and to develop new processes. A result of this “sales revolution” has been a new approach to selling called Inbound Sales. There are few people in the world who have studied, practiced, and refined the process like Brian Signorelli. In this book, Brian shares everything you need to know to be successful with this approach. It’s a must-have for any salesperson or growth executive’s bookshelf (or Kindle).